This may sound odd, but some the best comedy writing today may be going on over at Amazon.com. There has been some bizarre confluence around Looking For–Best of David Hasselhoff [IMPORT] that has resulted in (as of today) 420 of some of the most hilarious reader reviews you’ll ever have a chance to read. Go. Read. Now. In fact, I quite literally saw the light; within ten seconds of forwarding to track six (Hot Shot City, which is particularly good), I had an aneurysm and woke up twelve hours later in hospital. Sadly, the ambulance crew who went to my aid also suffered an array of mysterious head or ear-related maladies upon reaching my house – in the end they had to force a power cut before anybody could safely enter. I would dearly love to rhapsodise further the merits of David Hassleheamorrhoid’s album, but the doctors have warned against me having any further contact with said product. I shall have to content myself with buying a pair of very tight jeans, black leather jacket, and installing an effetely-voiced Speak and Spell in my car. A white-knuckle, deep-throated love fest! If there’s one thing the Maori are known for, its their age-old wisdom and curly hair. Through generations of oral tradition and perseverance, the proud Maori people have endured as storytellers, innovators, and as Jango and Boba Fett in the latest George Lucas installment. David Hoopervamp knows this, and he openly admits taking this formula for success and making it his own. So with the release of “The Best Of David Hoopervamp (IMPORT)” he reinvents the wisdom-and-curly-hair thing. The end result is a sweeping epic of kapa haka proportions. Brimming with freshness and musky skank and accompanied by a voice that sounds like eight llamas impaled on a jousters lance, these hymns of hunkiness stay with you like an extended case of mono. Hoopervamp takes off his leather boots, rubbing his moistened feet all over the compact disc, even rubbing it between his toes to soak up the funk. When we listen to this CD, it is as if we are inhaling the aroma of his sweaty, hairy callouses with all the power our lungs can muster. And who wouldn’t want that? The song Hot Shot City is particularly good. Don’t you feel sorry for all of those misguided fools who were manipulated by an over powering global network of media “style over substance” ethos? All of those who voted for “Imagine” by John Lennon as the greatest song of the last millenium were duped. Duped by a global conspiricy. A conspiricy that will not market this album, scared of the political and social upheaval that it’s success may entail. This seminal album has changed so much of my life already with the brilliance of the tracks included, so imagine my surprise when after a long session of what I call my “David” time I noticed something that had been staring me right in the face the whole time. That’s right…..the title. It made me think, in this world full of despair and misery are we not all looking for something to make our lives a happier and generally more fulfilled? We’re ALL looking for David Hasslehoff. We’re ALL looking for the best of something. We’re ALL looking for Hot Shot City, a place for revolutions at 11 o’clock, which after all is a particularly good place to be. There are the good. There are the great. There are the truly great. 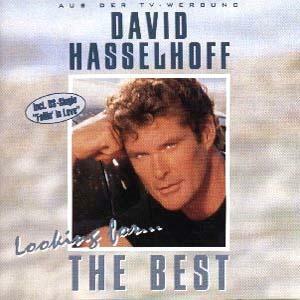 And there Is David Hasselhoff; a man alone on a lonely musical pinnacle. This is a record for everyone; a multilingual multigenre powerhouse compilation that brings to you, the grateful listener, the majesty of David’s euvre to date. There is, to my knowledge, no better way to kick off such an anthology than with an uplifting rock anthem to freedom. Track one is entitled ‘Looking for Freedom’ That’ll do nicely, sir. Track 13, ‘Freedom for the World’, just piles on the joy all over again, showing that he has not forgotten what a groovy hep thing freedom is. David proves he’s no stiff with the zany fun of ‘Do the Limbo Dance’, a masterpiece of crazy party fun that would disarm a heart of stone. ‘Flying on the Wings of Tenderness’ proves that David’s no clichï¿d macho man, with levels of lyrical tenderness unrivalled in the history of literature. For the young sophisticate, ‘Everybody Sunshine’ is a searching existential critique that, in my humble opinion, could stand shoulder to shoulder with the finest works of Kierkegaard, Schopenhauer or Minogue. I could go and on about this remarkable man’s achievements, his tunesmith’s ear, his lyrical genius, his truly euterpian connection to the music of the spheres, but I think one listen to ‘Hot Shot City’ will say more, far more than my stumbling mortal words can express. If music were a religion, its Messiah has arrived in the form of the uber bouffant David Hissyfit. With a voice that has been justly compared to the sound of a steam train colliding with a busload of eunuchs, the Hasslemeister belts out hit after mind numbing hit, covering all genres of music from banal to trite. His facile defence of his dishonest friend in “I Believe – Laura Branigan”, shows that not only is he a hackneyed entertainer par excellence, but he’s also a decent bloke. Somewhere in heaven, the angels are putting down their harps, picking up pointy, 80’s styled guitars, and strumming out cover versions of such venerated classics as “Flying on the Wings of Tenderness” and “Everybody Sunshine.” Only a genius could make the word ‘sunshine’ a verb. A master of production wizardry, Hanselgreteloff, has included the sphincter gritting song “Danice Dance d’Amour” which played backwards becomes track three “Do the Limbo Dance. ” Also included on this compilation of excrutiating Euro chart toppers is the legendary “Wir Zwei Allein”, which was awarded the prestigious Institute de Dentist prize for best tooth grinder 1987. Your enamel won’t stand a chance, and neither will your loins when you get to “These Lovein’ Eyes”. The song’s enigmatic title has spawned scores of Internet sites where people espouse theories as to the extra ‘e’. My own take is that it’s a typo and that there should be a space after the ‘e’, making it “These Love in Eyes”, since Hasbro’s trill vibrato is enough to make the strongest man bust a nut with such vigour that you’ll want to have your eyes closed, lest you go blind from sheer the velocity of your well spent love juice. I’m getting half a mongrel just humming the tune to myself. With the particularly good “Hot Shot City” in his repertoire, Knockitoff, is not merely a bigger love walrus than Barry White, he is truly a sperm whale. Take my advice, buy the album new and not second hand. Why? Because the previous owner must have died to have parted with it, maybe from a terrible disease. Yes, it’s that good. Don’t just buy this album, live it. The first time I saw David singing I was 13. I saw him on ITC’s “The Chart Shor”, he did his song “Crazy for You”. The way he punched the air repeatedly with his leather glofe clad fist whilst he was riding on his motorbike through the forests of Bavariea got me hooked like only Elkie Brookes or Kim Carnes had done before. I think David is a very good singer and i am sure he is a talendet guitar player an harmonicist. When the Berlin Wall came down I saw him in his light bulb jacket like on the pink Fliyd oalbum and I thought that maybe he would do a cover of “Love in the school yard” or “it’s a time of mayhem”, but he didn’t, he did the wonderful “Looking for Freedom” and I think it’s really good, better than the Bergman movie or that thing with the two angels when a rock lands on someone’s head and he’s dead and he wakes up by the wall and it’s in black and white. David’s better than all that and Baywatch and NichtRider prove it, but his singing is the best of it all and this compilation, which i have on my mp3 player and my jukebox and i play it all the time on my BMX, proves it, and I hear kids today and they’re asking about what’s the best music to listen to, and I say david hasselhopf and they say “who’s he” and I say he’s the person off nightr ider and baywatch and theyy’ve seen the shows byt they don’g know he sings and i say he dows and they listen and they hear “looking forf freedom” and all the hits and i say “now you know, this is waht music is about and your bf49 isn’t as good and they say, yes i know. Well, that’s what david hasselhoff is about to me. He is like a fine wine that matures, and that bit at the bottom of the bottel with all the sediment is the best, and david’s like that, his voice, his powerful persona, his big hands and his curly hair like a garden full of peat. I love david and I will play his music to my child when she comes out of hospital and maybe when she hears his voice she will realise that the world has been made what it is as the result of david’s presence and she will know that when she is older all she has to do is look at baywatch and knith rider and listen to the song “looking for freedom” and she will have mmore of an opinion of the world than if she went to kindergarten or read books or learnt how to speak. The song “Hot Shot City” is particularly good. A Milestone in Music History! For decades, musicologists the world over have pondered one question: Could anyone achieve a divine synthesis of the advances of Schoenberg and Stravinsky that would include the breakthroughs of musicians like Ellington, Parker, Armstrong and Mingus, yet also include the emerging tonalities and rhythms common to Carribbean cultures, West Africa and certain parts of the Yalu Valley? And now, my friends, we have the answer: David Hasteloff! In the same way that the ruggedly handsome Hassletoff’s contributions to the dramatic arts have challenged the very boundaries of theater, compositions such as “Is Everybody Happy?” or the instant classic “Flying on the wings of Tenderness” challenge us to rethink the very definition of music. More than the Ninth Symphony of Beethoven, “Everybody Sunshine” is an ode to mankind’s greatest joys; more than Mahler’s Das Lied von der Erde, “Do You Believe in Love” challenges us to question the very nature of our existence. As a singer, Mr Hustlenoff is without peer. Hearing the easy bilingualism of “J’Taime Means I Love You,” the only possible comparison is with Placido Domingo’s effortless transiton between various operatic idioms. Perhaps most praiseworthy of all is the fact that, unlike so many of the 20th century’s great artists, Mr Hesslefoff has used his considerable gifts in the service of a philosophy that flies in the face of the nihilism espoused by the likes of Schopehaur and Neitze. In compositions such as “The Best is Yet to Come,” he clearly acknowledges the darker side of the human predicament, and yet adorns it in rays of radiant hope that spray outward like rays from some sort of hope-producing ray gun. This is talent of a sort which cannot be denied. Ignore him at your peril! David Hankelbonk is someone who does not call a ‘spade a spade’, he calls it a ‘shovel’. This is evident throughout this latest masterpiece that has me diving through the surface of the lyrical content to discover what is and what could well be. The world is David’s lobster, as he has proved time and time again through his career firstly as a man who traveled the frontiers in his talking car and then as Mitch Buchanan, a modern day ‘Charles Ingels’ on Malibu Beach. His music is as forceful as his TV shows. One walks away from each gem of a song wondering about life and what we can do to make things a little better for ourselves – and boy there are many things! When I listen to his crooning I am taken away to a magical place where only people with clean underpants are admitted. This place is ‘Hot Shot City’ which is a particularly good song. As long as we’re on the subject of fragrance ads…OK, as long as I’m on the subject of fragrance ads…I think the latest compaign for Ralph Lauren’s Romance is an interesting example of women’s and men’s differing ideas of what “romance” really is. They stood facing each other. Neither spoke. He reached up with his strong, capable hands and slid her crisp, white blouse off her shoulders and down her arms, binding her wrists delicately behind her. His fingertips traced their way back up her arms. He took her gently by the shoulders and pressed his forehead to hers. She looked down, her eyes gazing first at his chest, then down past his rippling stomach, to where his tanned, supple skin constrasted against the white of his jeans. She closed her eyes, afraid that the moment might vanish, but the warmth of his breath on her soft eyelids told her that this moment — this man — was indeed real. Her haltered top restrained her heaving bosom but it could barely contain her beating heart. She leaned into him, arching her back slightly to maintain contact. He reached up and lifted her chin. She almost couldn’t bear to look at his face for fear losing herself forever in his deep brown eyes. He slid his hand onto the back of her neck and pulled her softly, gently, toward him…pausing just as their lips were about to touch. “I will love you forever,” he whispered as the rest of her world melted away. Contrast that with the ad for Romance for Men. He grabbed her roughly and spun her around, pulling her toward him and thrusting his tongue into her mouth. Now that’s romance. At least men think so…or at least Ralph Lauren thinks that men think so. I’m not sure what it says about me as a man but, while I think the ad for Romance for Men is perfectly O.K., the Romance for Women advertisement is absolutely amazing.